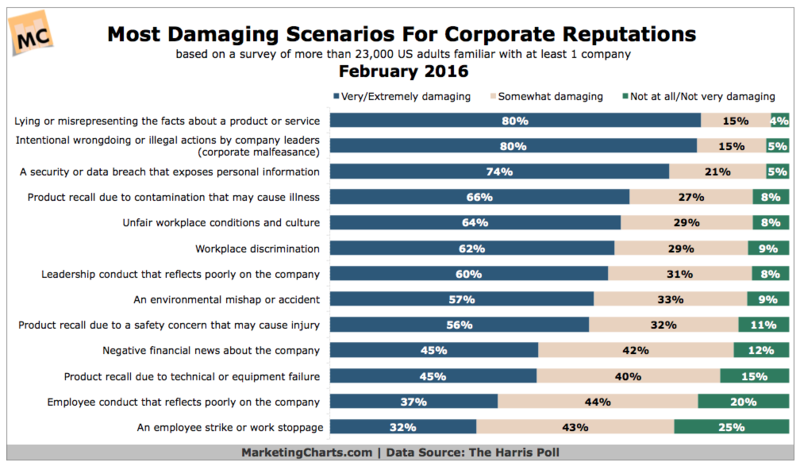 The Reputation Institute publishes an annual study of corporate reputation in America, and now, in 2018, the US RepTrak 100 reveals an average three-point decline in company reputation. This is the most significant downward trend since 2008, made even more startling because each point corresponds to $1 billion in market capitalization. All reputation dimension scores are down, says the report, because there is a growing belief companies focus on profits over people. Another survey from Marketing Sherpa finds that the most broadly cited experience among dissatisfied customers was the company not putting their needs and wants above its own business goals. What are the companies with the best reputations doing right? More and more we are seeing that reputation moves markets. There is a strong correlation between the market capital valuation of a business and its ability to create a good reputation. The past few years have shown the power of reputation to change the world; it had a hand to play in Brexit, in the election of Donald Trump, in the emergence of the #MeToo movement. The reputation of CEOs around the world is now being scrutinized because of cases of inappropriate sexual behavior. We are seeing the emergence of the dawn of the reputation economy—reputation is now the currency on which everything else will depend. On a company level it drives whether people say good things about you. On a personal level it defines your job, your career, and your next move in life. Reputation is all around us and it is driving human behavior. 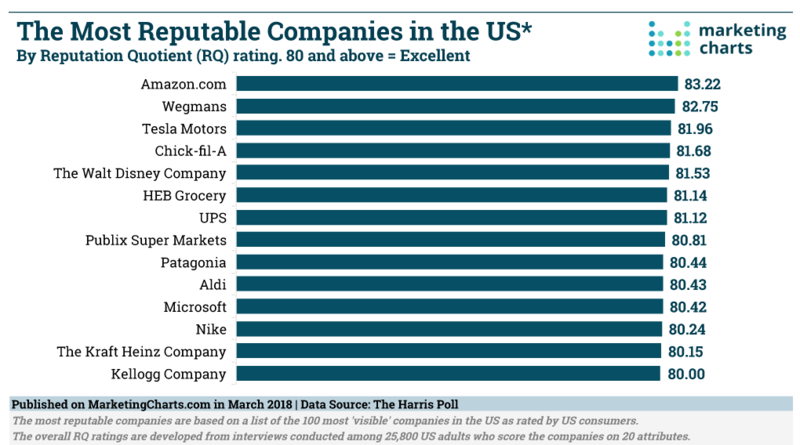 And what do we see with the worst-ranked companies? The dubious honor of the worst rating of the 100 most visible companies goes to Takata, responsible for “the largest and most complex safety recall in U.S. history.” The Weinstein Company is next. Equifax is the third. The Trump Organization ranks 5th-from the bottom out of the 100 companies. But rankings only take us so far. Let’s look at the policies beneath the rankings. How do companies pursue profit over people? A notable example is the Epipen debacle, where Mylan Pharmaceuticals chose to hike prices to $600 up from roughly $100 when they acquired the life-saving product. These are examples of moral myopia, where the pursuit of profit crosses the line of civilized behavior and ventures into “evil” territory. This tone-deaf mindset is not, unfortunately, an exception. For many businesses, it is part of the engine of profit-making. What is Doing the Right Thing? Many public relations experts talk about “active reputation management” to help salvage broken reputations. This is the old world, where expensive campaigns and staged press conferences are used to mitigate reputation damage, while the underlying causes remain unaddressed. In a sense this was #fakevirtue. The idea that companies must do the right thing has been around since the very beginning, but what does this really mean? Is that what we mean by doing the right thing? 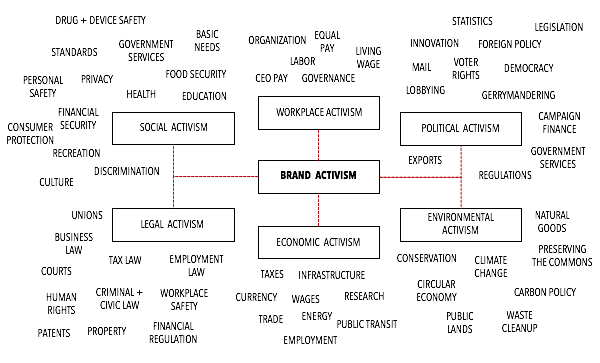 We think a brand activism framework is an effective way to understand where we’re headed. Pope Frances writes about the Principle of the Common Good in Laudato Si, where the earth is our “common home,” and the climate a “common good.” The Pope doesn’t mince words: The alliance between the economy and technology ends up sidelining anything unrelated to its immediate interests. Consequently the most one can expect is superficial rhetoric, sporadic acts of philanthropy and perfunctory expressions of concern for the environment, whereas any genuine attempt by groups within society to introduce change is viewed as a nuisance based on romantic illusions or an obstacle to be circumvented. Is the Pope out of his mind? Or is he warning us to manage with people (and the planet) above profits? For us, let’s define the common good using Wikipedia: what is shared and beneficial for all or most members of a given community, or alternatively, what is achieved by citizenship, collective action, and active participation in the realm of politics and public service. The question then arises, what is the community? For the multi-national business, community is local, regional and global. It matters how you treat your employees all over the world. Polluting one side of the world to profit on the other side is not a viable strategy, in fact, it is a crime. 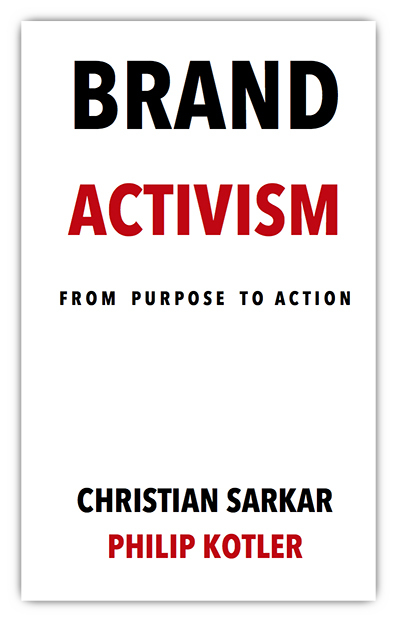 When company actions go against the common good, we will increasingly see a backlash from consumers and society at large. 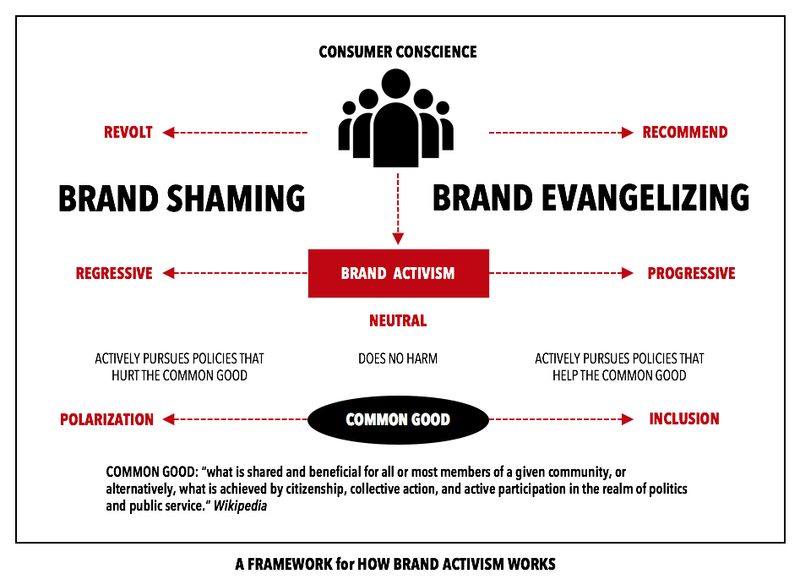 Businesses will have to be aware of what the common good is, and where the lines are drawn by an increasingly activist consumer. In other words, businesses must stay abreast with the conscience of the customer. Do our practices align with our values? Are we participating to find solutions that work for all? Are helping or hindering communities achieve what is best for society? Are we lobbying politicians in ways that seek unfair advantages? Are we creating an inclusive world or are we aiding in its polarization? Are we respectful of the commons, or are we seeking to exploit it for profit? Injustice anywhere is felt everywhere. Do we really want low-prices that are the result of exploitation, slave labor, or environmental degradation on the other side of the globe? The true cost of low prices is that the cost is borne by society – to its detriment. Globalization has brought many changes, and as we are learning now, not all of them were good. The feelings of powerlessness and frustration in a world dominated by wealthy elites has led to the resurgence of nationalism, protectionism, and growing threats of war and violence. Our business leaders have forgotten history. It’s time for leaders to stand up and make a difference. The ones that do will be rewarded, not just monetarily, but as true stewards of civilization on this planet.